Many times, family pets are our first loves. This week we are celebrating my dog, who was our first “baby”…the first living thing my husband and I had to care for before our children arrived. He’s been with us for 11 years this week and I love remembering the first few moments of him meeting my other babies. Each time he was sweet, kind, and very affectionate – kissing both the baby’s face and then my face each time we brought home another little boy. I feel lucky that the transition from a one-dog-family to a family with three sons and a dog has gone smoothly. Here are some tips to help the transition for your family, too. 1. Be proactive with the introductions. Bring a receiving blanket, or baby cap to the hospital to keep near the baby so the baby’s scent is on it. Then have someone bring that object from the hospital to your home prior to baby’s arrival at home. This allows the pet to become familiar with the scent of your baby before he/she arrives. 2. Be present for the introduction. Don’t assume everyone will get along and be accepting, so be as close as you can to your pet to reassure him or her that this new baby is a part of your family. 3. Know your pet. Try to continue the same routines as best as you can. If your pup is used to an early morning walk, someone else may need to make sure this task is covered when you first come home with the new baby. (Late night feedings and pumping sessions can keep the early morning walks from happening as frequently as your pet is used to. Most babies have a witching hour that happens exactly during the evening time when some dogs are used to having a night-time run at the park. See if a neighbor or close friend can help you keep your dog’s energy expelled while you adjust to bringing the new baby home. 4. When nursing your baby, your pet may be very curious and want to sniff up close when you’re trying to calm the baby or soothe the baby. I remember my dog liked to lick the pump parts if I left them on the couch or coffee table – I tried to quickly teach him this was not allowed. If he was aggressive or too curious, he was scolded but if he was gentle, he received lots of treats and extra attention. 5. Be sure your baby is always safe. If your pet shows any signs of aggression or unpredictability, keep them apart until this subsides. Crating your pet or using a baby gate to keep both parties protected is a good idea. In some cases, bringing in a professional pet trainer can be very helpful because it brings in an objective party who can help you and your pet adjust to the new living arrangements. Hopefully your pet and your baby’s lives will mesh together beautifully. 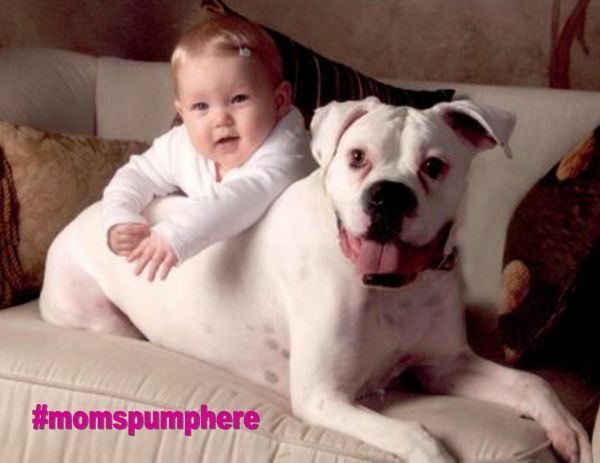 You love both your babies and soon they’ll love each other, too.